Die zurückhaltende Hardware-Ausstattung wirkt sich positiv auf dem Energiebedarf aus: Unter hoher Last zieht das ThinkPad SL510 NSL7QGE gerade einmal 26,9 Watt aus der Steckdose. Wer sich lediglich mit Textdokumenten und Browser umgibt, wird einen Verbrauch von 15 Watt gutheißen können. Der Akku hält unter konstanter Last (50% CPU-Belastung, WLAN aus, Bildschirmhelligkeit reduziert) gute 2,5 Stunden durch. Die Hersteller satteln auf Intels neue Notebook-Plattform um und senken für topaktuelle Geräte mit Centrino-2-Technik extrem die Preise. Wenn Ihnen als Arbeits-Notebook oder zur gelegentlichen Freizeit-Nutzung auch ein Auslaufmodell genügt, sparen Sie mit dem Lenovo ThinkPad SL510 viel Geld. Zu diesem Preis gibt es derzeit kaum andere 15,6-Zoll-Notebooks, die ihm in Ausstattung und Verarbeitungsqualität das Wasser reichen können. Das Lenovo Thinkpad SL510 ist ein sehr gutes Office-Notebook. Vor allem die vielen Aufrüstmöglichkeiten und Schnittstellen sucht man in dieser Preisklasse sonst vergeblich. Das Thinkpad patzt jedoch in zwei Disziplinen: Zum einen gibt die Tastatur an mehreren Stellen stark nach, und der Lüfter ist für ein Office-Notebook zu laut. Insgesamt schrammt das 550 Euro teure Lenovo Thinkpad SL510 deshalb denkbar knapp an einer Auszeichnung vorbei. Seit Lenovo im Jahre 2005 die Rechte an den ThinkPads von IBM übernahm, finden sich zunehmend auch Notebooks in der ThinkPad-Familie, die sich eher an den Endverbraucher als an Geschäftskunden wenden. Die SL-Serie bietet dazu einige bekannte Qualitäten, wie die gute Tastatur, den Trackpoint, die Festplattensicherung, die gute Software und den Fingerabdrucksensor. Diese Sicherheitsfeatures machen das ThinkPad SL510 auch für kleinere Unternehmen interessant. 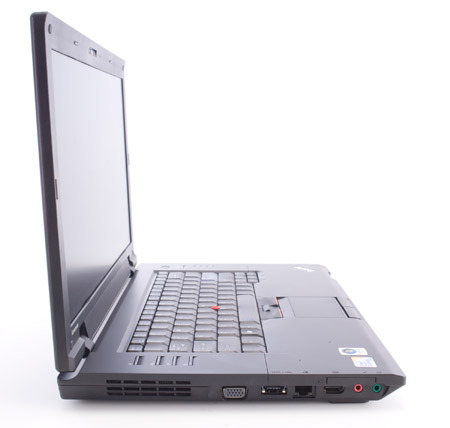 Overall, the ThinkPad SL510 is a solid Windows 7 machine. Its wide screen gives ample room to work without a full jump up to a monster-size model. The defining ThinkPad reliability is very much present, and its speed is admirable. True, battery life could be a bit better, and Lenovo really should have given the SL510 a bit more punch - you certainly won't want to try to play anything graphically demanding - but it's a surprisingly light, remarkably quick notebook. In short, it's a ThinkPad. The Lenovo ThinkPad SL510 proved to be a reasonable compromise between price and quality. While it doesn't offer the nicer touchpad or rugged build quality of the T-series, it retails for almost half the starting price. The SL-series is a good option for users looking for only basic qualities in a notebook like a standard WXGA screen or integrated graphics. It still offers a great keyboard and extended batteries if you plan on typing documents all day without breaking the wallet. 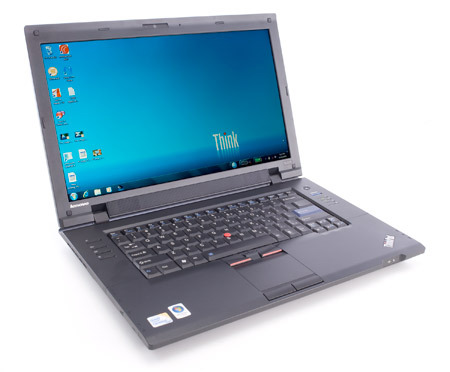 Overall, the ThinkPad SL510 is a solid Windows 7 machine. Its wide screen gives ample room to work without a full jump up to a monster-size model. The defining ThinkPad reliability is very much present, and its speed is admirable. True, battery life could be a bit better, and Lenovo really should have given the SL510 a bit more punch--you certainly won't want to try to play anything graphically demanding--but it's a surprisingly light, remarkably quick notebook. In short, it's a ThinkPad. When Lenovo introduced the SL series last year, not everyone was thrilled with what they saw. Any changes to the venerable ThinkPad lineup come along with scrutiny, but this small business series was seen by many as a watering down of the brand. Ultimately the SL510 is a good buy in a highly competitive space where there are not really any clear standouts. It is a thoughtful evolution of the SL series as well as a step up from the SL500. The $499 starting price is there just to attract buyers, but for well under $1000 you can have a Windows 7 productivity machine. Lenovo's ThinkPad SL510 is a refresh of their budget 15-inch ThinkPad lineup that coincides with the Windows 7 launch. 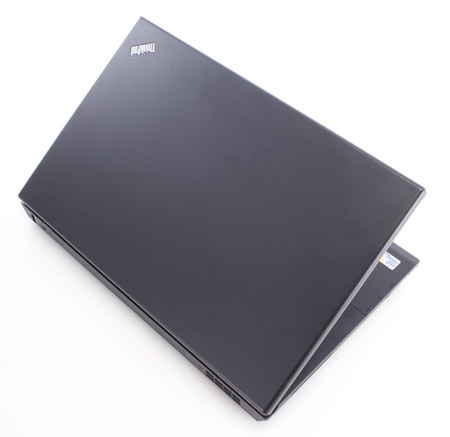 The laptop retains a very business-like appearance with a bulky, boxy design that could really use some updating. Beyond the looks though, the system does perform extremely well thanks to a higher end Core 2 Duo processor, 4GB of DDR3 memory and a fast hard drive. It would be nice to see a dedicated graphics standard in the system but it is designed for small to medium-business users on a budget. In many ways the Lenovo ThinkPad is the Model T of laptop computers. You can have any color you want, as long as that color is black and they pretty much all look and act the same. This lack of choice isn't so bad with systems like the new SL510 ($889 direct), a durable, solid performer of a laptop that's built for the long haul. Lenovo's new small business laptop, the ThinkPad SL510, is a no-frills business system that gets the job done but not much more. Without proceeding any further, I am about to make a guess: you have already decided whether or not you're buying a ThinkPad. The iconic brand, the unending combination of professional respect, solid features, and unabashed blandness, combine to make a product that has surprising appeal across the board, yet remains, literally, a black box. 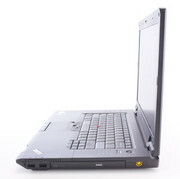 The newest update to the line, the ThinkPad SL510, is part of Lenovo's Windows 7 product launch. Like many companies, Lenovo is taking the 7 launch as an opportunity to tweak and improve some of the features in their existing line, and so it is with the SL510. Lenovo's Windows 7 upgrade to the ThinkPad SL500 keeps the price affordable, and features a consumer-friendly 16:9 display. This sturdy and comfortable small business notebook performs well, and offers smart tools to protect your data. 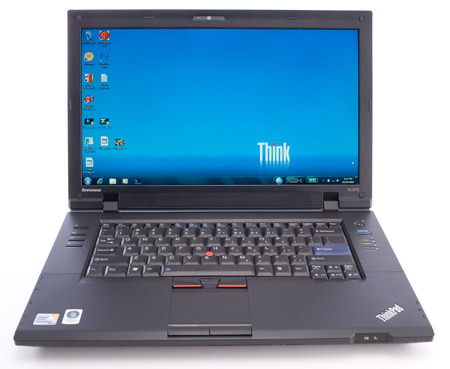 The Lenovo ThinkPad SL510 is a solid notebook for business users. While it may be too bulky for road warriors (the 14-inch SL410 is a better choice for that crowd), this system is a good solution for workers looking for a sturdy laptop to use in and around the office. Its combination of above-average performance, a comfortable, spill-resistant keyboard, and business-friendly services make it a strong value. Of late, a lot of refugees from the corporate fold have found themselves among the swelling ranks of consultants and independent contractors. But that doesn’t mean they have to do without one of the perks of the mother ship: a ThinkPad notebook. In the ThinkPad SL510, Lenovo delivers a mainstream 15.6-inch entry for the small-business market with some of the familiar ThinkPad comforts—namely, the comfortable keyboard and dual pointing devices—though with some corners cut to hit a $549 starting price for the line. The SL510 offers decent performance for productivity apps for small-business users, but some ThinkPad niceties have been jettisoned to keep the price low. Vor drei Monaten durften wir das ThinkPad SL510 NSL7QGE (wir berichteten) in unserer Redaktion begrüßen. Mit dem ThinkPad SL510 hat Lenovo im Tor der günstigen Officenotebooks einen Volltreffer gelandet. Um ein gutes Preis-Leistungsverhältnis zu bewahren, verzichtet Lenovo auf neueste Leistungskomponenten und greift stattdessen auf günstigere und zugleich für die Zielgruppe ausreichend leistungsstarke Hardware zurück. Intel Graphics Media Accelerator (GMA) 4500MHD: Im GM45, GS45 und GE45 Chipsatz (Montevina Plattform) integrierte shared Memory Grafikkarte von Intel. Durch höhere Taktung und mehr Shader ist sie deutlich schneller als die X3100, jedoch immer noch nicht für Spieler empfehlenswert. Kann HD-Videos (AVC/VC2/MPEG2) dekodieren und so die CPU entlasten.» Weitere Informationen gibt es in unserem Notebook-Grafikkartenvergleich und der Benchmarkliste. T6670: Einstiegsprozessor basierend auf den Penryn Kern. Baugleich mit dem C2D T6600 jedoch mit freigeschaltetem Virtualisierungsfunktionen VT-x und höherer max. Temperatur.T6570: Einstiegs-Doppelkernprozessor basierend auf den Penryn Kern. Jedoch bietet er nur 2 MB Cache und FSB800. 75.47%: Weltbewegend ist diese Bewertung nicht. Obwohl es bei den meisten Websites einem "Befriedigend" entspricht, muss man bedenken, dass es kaum Notebooks gibt, die unter 60% erhalten. Verbalbewertungen in diesem Bereich klingen oft nicht schlecht, sind aber oft verklausulierte Euphemismen. Dieses Notebook wird von den Testern eigentlich als unterdurchschnittlich angesehen, eine Kaufempfehlung kann man nur mit viel Wohlwollen darin sehen. » Lesen Sie auch unsere Notebook-Kaufberatung.